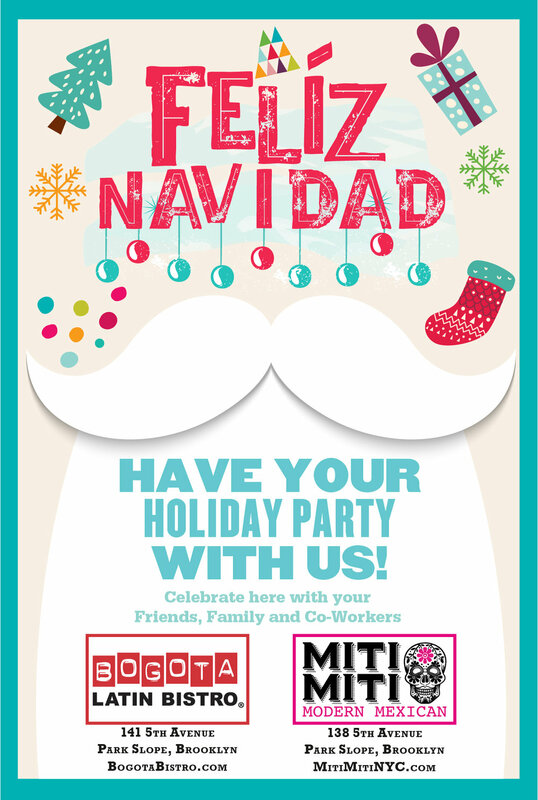 HAVE YOUR HOLIDAY PARTIES WITH MITI MITI! Want delicious Mexican food at your holiday party? Want to host your party at Miti? Whether you need a space for your holiday event or want our food catered straight to you, we can help! Contact us now to start planning your best holiday party ever! Need an excuse to eat tacos and partake in some excellent Mexican drinks? Cinco de Mayo is coming, and we'll give you cinco reasons to spend it with us. First, we're celebrating by offering you some complimentary tastings from our friends at Negra Modelo & Modelo Especial, Mezcal Union, Corona, Bayou Rum, Milagro Tequila, and Stoli! We'll also have $5 TEQUILA SHOTS, $5 DRAFT & BOTTLED BEERS, and GIVEAWAYS you'll love! Oh, and the last reason? You'll be able to eat, drink, and party until you vow never to spend another Cinco de Mayo anywhere but Miti - salud! As you know, we're located on Park Slope's fantastic Fifth Avenue. So we're proud to celebrate food on Fifth at Taste of Fifth, which will take place on April 4th from 4:30-9:30 pm at the legendary Grand Prospect Hall! Tickets are $60, and 20 of those dollars will be donated to the local charity of your choice upon payment. As you walk around, enjoying unlimited tastings of Park Slope's best dishes (not to toot our own horn), sipping on unlimited drinks (now we've got your attention! ), you'll be treated to great music and an awesome night. Join us for Dine In Brooklyn! From March 20th-30th, we'll be participating in Dine In Brooklyn, where we'll be offering prix-fixe dinners and specials! We'll be joined by some of our favorite Brooklyn restaurants. Make sure you stop by to check out what we're serving—not only is it a great deal, you'll be supporting local business! Hello, thinkers! This past weekend, we were fortunate enough to be the ONLY food vendors at Brooklyn Public Library and Cultural Services of the French Embassy's wonderful event, A Night of Philosophy and Ideas! Did you catch us at the first ever Best of Brooklyn Food & Beer Festival this past weekend? We served up some of our favorite menu items—and proudly paired our tastiest tacos with refreshing beers—at Industry City in Sunset Park. We were the winners of Best Margarita (*insert applause emoji here*). We can't wait to see what's in store next year; thanks for having us! Taco Tuesday Is Now 5 Days Per Week! You asked, we answered: Taco Tuesday is now Monday, Tuesday, Wednesday, Thursday, and Sunday at Miti Miti! Check out our taco menu and stop by to see which new ones we're recommending :) Taco in one hand, margarita in the other, everyone's happy. BUILD YOUR OWN TACO BAR Now Available for All Your Awesome Events! Having a party or hosting an event and want to serve something unique and delicious? Look no further than our new BUILD YOUR OWN TACO BAR! We supply you with everything you'll need to make it an event to remember, from setup to cleanup. That's right, we give you taco fillings, handmade tortillas, side orders, utensils, and even desserts! 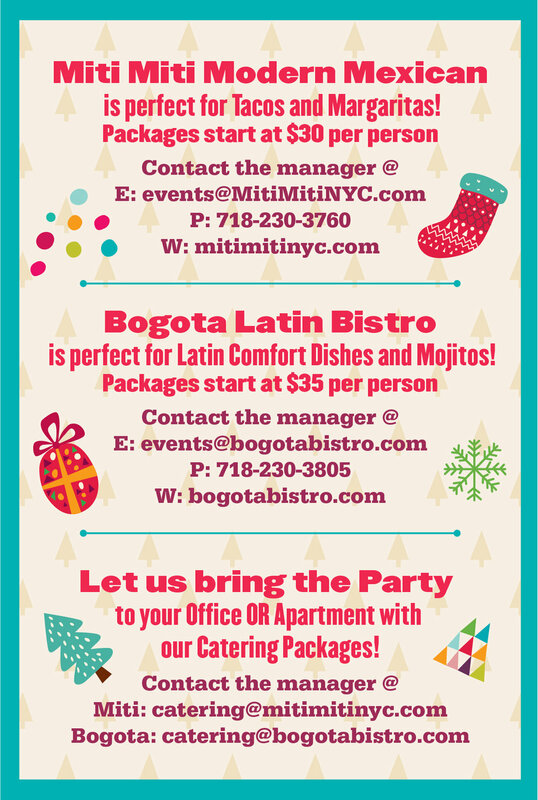 We'll cater this straight to you -- just give us a call at 718-230-3760, send an email to events@mitimitinyc.com, or stop by in person to taco bout it!